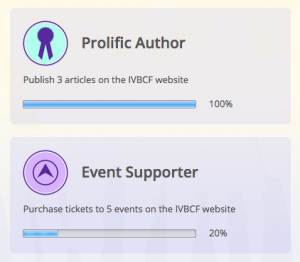 IVBCF Achievement Badges are a way to recognize and reward members for actively contributing to and participating in the IVBCF community. They can be earned by all members of the IVBCF and by striving to earn them all you will be helping to build and strengthen the IVBCF and it's value to all members! Earned badges can be viewed on each member's profile page, just underneath the member header (see Figure 1). Other members will only see badges that you have earned (badges not yet earned will be hidden). On the other hand, if you are viewing your OWN profile page (and are logged into the site) you will see all available badges (those you have earned showing in color, and those not yet earned greyed out.) You can also hover the mouse pointer over any badge for a few seconds to view the badge name and it's status (see Figure 2). Click on any of your displayed badges within your profile. Periodically you will be able to take advantage of special offers and discounts available only to those who have earned certain badges, or all badges, etc. These may include membership discounts, advertising discounts, event ticket discounts, etc. Keep your eyes peeled for these special offers so that you don't miss them when they occur! If you would like more information or have any questions, feel free to ask away below in the comments. As always these tutorial and FAQ articles are a continual work in progress and your interaction helps to create a more rewarding and complete IVBCF experience for all!